Looks like 60s and 70s throughout the next ten days or better. Tomorrow is sunny and lower 70s. Upper 60s over the weekend and low 70s for the early part of next week, then upper 60s. Not seeing any winter weather anywhere in the forecast!! Still the same generation pattern. Either no generation all day, or a couple units on in the morning for a couple hours, then off until late afternoon when we might see one or two units come on again for a couple hours. Wednesday Jim had a fun and productive day on the filoplume early, the JQ later and then the red soft hackle late in the afternoon. Lots of wind yesterday…..blew them off anchor several times and they were fishing in white caps on occasion. The fish didn’t mind. Good reports coming from fishers on the river. Most everyone catching nice and several fish, and lots of different patterns seem to be working. Better go fishing!! 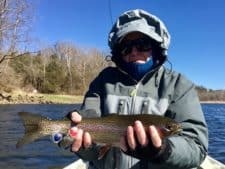 This entry was posted on Thursday, March 2nd, 2017 at 3:20 pm	and is filed under Fishing Reports. You can follow any responses to this entry through the RSS 2.0 feed. You can leave a response, or trackback from your own site.